The Best Cat Food blogs from thousands of top Cat blogs in our index using search and social metrics. Data will be refreshed once a week. About Blog Catological provides up to date, well-researched information for the discerning cat owner.Backed by research and written for cat lovers, we’re here to provide all the information you need in one place. Follow this blog to get information on cat food. Facebook fans 30,920. Twitter followers n/a. About Blog Catster collects helpful and hilarious information for cat lovers. A resource for real cat owners who passionately argue the merits of catnip at dinner, have very real opinions on vet costs, and are willing to devote their time and financial resources to please the creatures that really run their households. Follow this blog for information on Cat food. Facebook fans 126,822. Twitter followers 42,346. About Blog All you need to find a kitten and raise a happy, healthy cat. Follow this blog to find out what cats can and can’t eat. Facebook fans 35,500. Twitter followers n/a. United States About Blog Our cats lead busy lives, when they are not sleeping of course. Learn about their dietary needs and share in some of our favorite cat food recipes. Facebook fans 599. Twitter followers 91. Facebook fans 7,370. Twitter followers 922. Sister to @ModernDogmag About Blog Your guide to everything cat! Get inspired with the best ideas & solutions for a life with cat—the coolest cat accessories & toys, behaviour and wellness. Follow this blog to get information on cat nutrition. Facebook fans 902,481. Twitter followers 5,604. Kansas City About Blog Welcome to Floppypcats, uniting Ragdoll Cat lovers worldwide since 2008. Read our blog for information on cat health care, rescue tips, product reviews and more! Follow this blog to know about cat food. Facebook fans 39,594. Twitter followers 4,980. United States About Blog Halo Pets is America’s Best Loved Holistic Brand, believes nutrition is the single most important factor in the quality of a pet’s life. Follow this blog to get information on cat food. Facebook fans 120,398. Twitter followers 54,166. Denver, CO About Blog The Clean Label Project is dedicated to educating consumers about the cleanest food brands with unbiased, science-driven information. Follow this blog to know more about cat food products. Facebook fans 6,453. Twitter followers 469. Bangor, ME USA About Blog Green Acres Kennel Shop is a full service pet care business offering pet-friendly boarding, daycare, grooming, training classes, and behavioral consultations for cats and dogs. Follow this blog to get information on cat food. Facebook fans 3,122. Twitter followers 167. About Blog Welcome to Food Puzzles for Cats, a one stop resource for information about feeding your cat using foraging toys! Facebook fans 1,519. Twitter followers 227. About Blog The only Cat Blog updated daily on everything about cats! If it has fur, paws and purrs, we are all over it! This news site is by cat lovers for cat lovers! Follow this blog to get information on Cat's Food and nutrition. About Blog Petmio is a one-stop-shop for providing your furry friend with the food designed specifically for their needs. Follow this blog for articles on cat food. Facebook fans 1,981. Twitter followers 2,657. About Blog The best cat food advisor to share tips about best cat food, cat health, cat breeds and cat products. 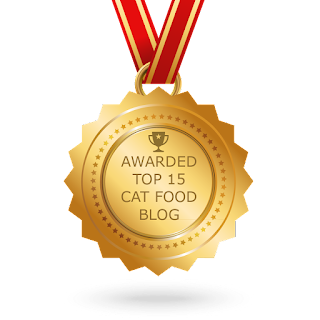 CONGRATULATIONS to every blogger that has made this Top Cat Food Blogs list! This is the most comprehensive list of best Cat Food Blogs on the internet and I’m honoured to have you as part of this! I personally give you a high-five and want to thank you for your contribution to this world.